My family and I went to this newest ribs place along Amoranto area: Highway Ribbery Grille. Opened last May 2015, Highway Ribbery Grille is the newest baby of Chef Niño Runas, also the chef of El Cangrejo near Morato area. Highway Ribbery Grille is an open-air hangout place specializing in ribs and other delicious comfort food. For starters, we had the Poutine (Php 195) and Taco Salad (Php 175). A healthy option is the Taco Salad, which I liked most because of the very tender pulled pork salsa and generous amount of cheese sauce put in. We also had their Houseblend Ice Tea (Php 125) while we wait for our food. We got to try Highway Ribbery's Chicken Wings (Php 250 for half dozen, Php 500 for a dozen). We tried two of the six flavors: Sweet Chili Glazed and the Red Devil. I like the level of spiciness of the Sweet Chili Glazed Wings but I should warn you with the Red Devil -- this flavor is not for the weak. We will never miss the bestselling Highway Ribbery's Pork Ribs (Php 250 for half rack, Php 500 for full rack), served with rice, corn and coleslaw. You may add Php 50 to upgrade to Dirty Rice. Dirty Rice (Php 65) is a Cajun dish made with liver, cayenne and black pepper. The Dirty Rice goes really well with the ribs. I love how the tenderness and flavors of the ribs were consistent to the last bite, as the ribs have been marinated and braised for hours before grilling. A half rack could be shared by 2-3 persons and good enough for its price. For desserts, we had the Cheesecake (Php 135) and Ice Cream Sandwich (Php 125). As a cheesecake fan, I was impressed with their cheesecake. Generously topped with blueberries, it is amazingly a bang-for-buck treat. Our little girl was immensely happy with the Ice Cream Sandwich that we almost didn't get to try, but the cookies used as a sandwich complements the vanilla ice cream quite well. I love how well-presented and reasonably-priced the dishes in Highway Ribbery Grille are. The service is excellent, and the food is amazing. It is a place that friends and family can hang-out while enjoying good food. Here's another good news! 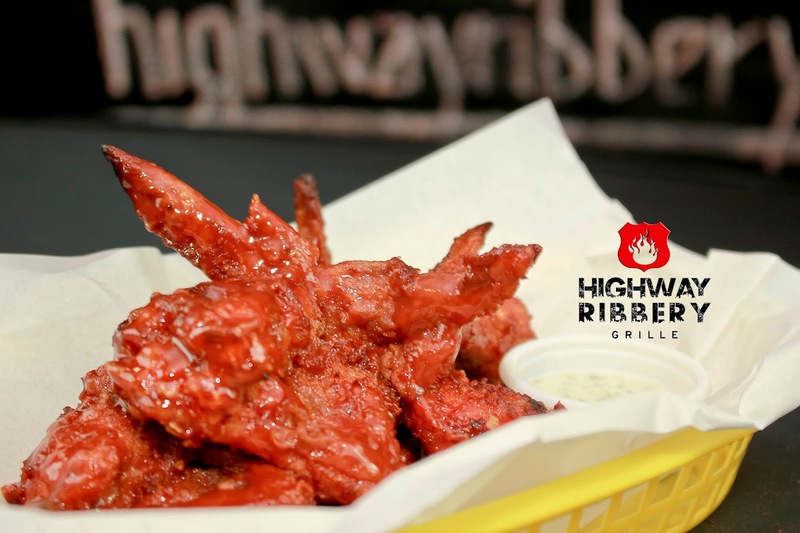 Starting November 30, Highway Ribbery Grille will be offering UNLIMITED BUFFALO WINGS for only Php 350 from Mondays to Wednesdays, 6pm to 9pm. This includes 2 choices of sauce, unlimited rice and unlimited iced tea. This promo will be until the end of December so try it while it lasts. Thanks to April de Luna and Chef Nino Runas for having us.